AUSTRALIA: Developer RES Australia has secured a long-term power purchase agreement with a consortium led by telecommunications firm Telstra for the first 226MW Murra Warra wind project in Victoria. 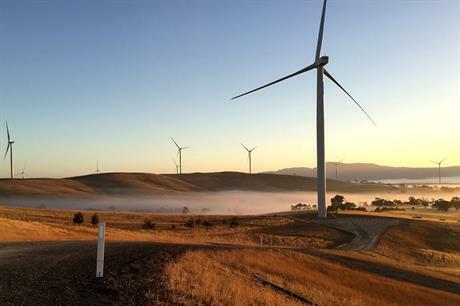 Telstra has partnered with bank ANZ, drinks producer Coca-Cola Amatil, and the University of Melbourne to buy the power from the first phase of the Senvion-equipped project when it is completed in mid-2019. The deal means RES has the financing in place to begin construction, after securing the necessary permits in December 2016. Eventually, Murra Warra could total 429MW in capacity. In June 2017, Senvion won a framework deal with RES to supply 116 of its new 3.7MW turbine with a 144-metre rotor diameter. "Telstra has coordinated [a] landmark deal, which underwrites the first stage of this wind farm, [and] will bring investment and create a real jobs boost for regional Victoria, and reduce Australia's emissions," said RES Australia CEO Matt Rebbeck. The Murra Warra project is also part owned by Australian investment firm Macquarie Capital. In June 2016, the Victoria state government announced renewable energy targets of 25% by 2020, rising to 40% in 2025 – in stark contrast to the stumbling federal government's renewable energy plans.